In the October 2012 Test Construction and Validity, we took an in-depth look at the quality of an instructor-developed test by examining the validity of test items. This post will focus on applying those concepts through the appropriate selection of test item types. Each test item type has inherent strengths and weaknesses and choosing the appropriate item type is like choosing a vehicle to carry a load. To choose a suitable vehicle you must know the load specifications and circumstances it will be operated in. The load specifications for your test items types come from your learning objectives. The objective’s “action verb” provides the class of load and the “conditions” define the operating environment. First aid students will be able to state the ten steps of cardio-pulmonary resuscitation (CPR) in the order of performance, from memory with complete accuracy. The action verb is to “state”. Working from a list of action verbs, you would find the verb in the knowledge category within the Cognitive domain. Within the knowledge category are several possible test item types including: true/false, completion, multiple-choice, short answer, and interview. To choose the appropriate test item type, you must also consider the learning objective’s conditions. To continue the vehicle analogy, it is like the difference between 2 wheel and 4 wheel drive. If you plan on getting your load (action verb) over muddy or icy conditions you will need a 4-wheel drive vehicle. Since the conditions are specified as “from memory”, I submit the only appropriate choice is an interview. It is the only test item type that can support the action verb (behavior) “state” and the condition “from memory”. Some might question why not the ubiquitous multiple choice format? Once you supply the correct answer to the student it changes the behavior to “recognize” and the condition would be given a list vs. solely from memory. Below is a table of suggest test item alignments with the various levels within Bloom’s Cognitive domain. In my blog on Learning Theories and Instructional Design I suggested that each theory has strengths and weaknesses and one of my goals for this Blog is to expand your options, so I am going to include Gagne’s learning outcomes (which is cognitive theory based vs. Bloom’s which is behavioral theory based) as an alternative set of domains. Why? Some day you may wish to include learning objectives (outcomes) that are outside the Behavioral realm; “cognitive strategies” for example. Note: Intellectual Skills have 4 distinct classes. 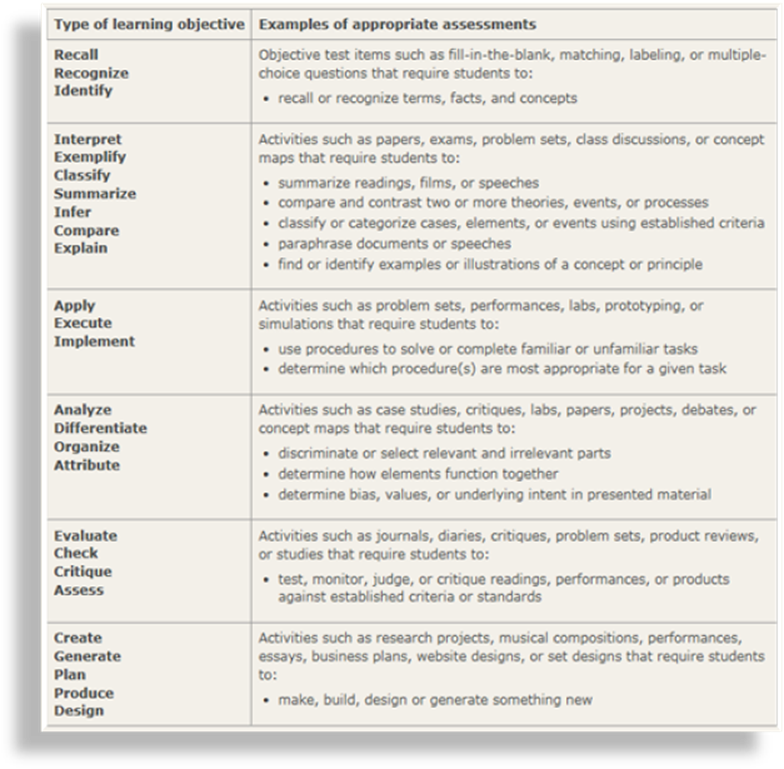 The same appropriateness of test item type can be applied to Gagne’s learning outcomes (think domains). See a table of appropriate test item types based on Gagne’s learning outcomes. From information to practice. Offer to do a review of one of your co-workers’ tests. Get a copy of the learning objectives and evaluate the test item types use against the action verb AND conditions of the associated learning objective using one of the domains (outcome) schemes. Talk over any discrepancies. Suggest alternatives. CAUTION: this may lead you to the re-evaluate the quality of your objectives.